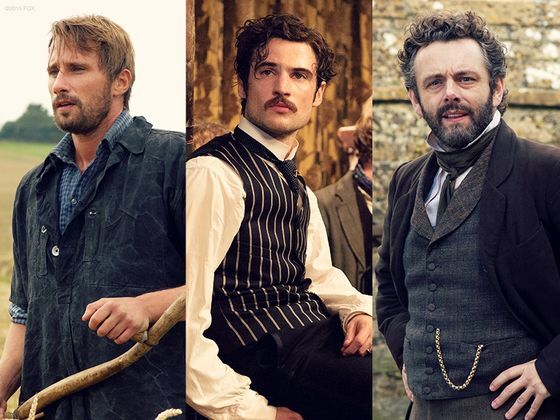 Far From the Madding Crowd is one of those stories I was inspired to read after I saw the film edition (2015). And the book was even better than the film because I was able to indulge in Hardy's eloquent usage of the English language. It is so wonderful; I am shamefully gushing. The setting is Victorian England, in the fictional town of Wessex. The main character is extraordinarily independent, self-sufficient, and intelligent, Bathsheba Everdene. Of course, she is also attractive (and vain). She inherited her uncle's farm and is extremely well off and formidable. But if that were not enough, she also has three totally different suitors. Suitor #1: Farmer Oak is a good man. He is self-controlled, well grounded, realistic, and strong as...oak. He was only a poor farmer, until he lost his farm; now he is a poor shepherd working on Miss Everdene's farm. She could never marry him, even if there were a chance. But he kept his heart to himself, knowing that he would never force the issue with Miss Everdene, especially if she did not love him. Suitor #2: Mr. Boldwood is wealthy and dignified, but annoyingly persistent. Miss Everdene does not love him, and he does not care. He is obsessed with having her as his wife. He pushed her so often that she was pressured into considering his proposal. He is so...bold! And finally, suitor #3: Sargent Troy is an arrogant young casanova. He is a liar, but people make exceptions for his bad behavior; even Miss Everdene overlooked his insincerity. She completely lost all of her good sense and succumbed to her emotions. At first, it did not appear that Miss Everdene was slightly interested in marriage, at all. She certainly did not need anyone, and she loved herself enough to sustain her need for love forever. It was not unusual when she rejected both Farmer Oak and Mr. Boldwood; but when Sargent Troy entered her town and pursued her, she surprisingly married him. Ugh! He was a horrible husband; while poor Farmer Oak and Mr. Boldwood stood by and witnessed this jerk misuse the women they loved. Shortly after we learned that Sargent Troy was supposed to marry a young woman who was pregnant with his child. He abandoned his obligation, before marrying Miss Everdene, and the woman and her child died. Distraught, he fled for a year, faking his death. When a year passed, he returned to take Miss Everdene back and what he thought was rightly his. But in Troy's absence, Mr. Boldwood convinced Miss Everdene into marrying him again. The night he decided to announce their engagement, Troy showed up and ruined Boldwood's chances. Being a man who hated rejection, he murdered Troy and turned himself in to authorities. This was too much for Miss Everdene; she would never be the same again. Miss Everdene finally realized that Mr. Oak was the only true friend she had. He managed her farm and saved her from devastation, on numerous occasions. And now he had inherited Mr. Boldwood's farm, since Boldwood would be incarcerated for the remainder of his life. However, Mr. Oak decided to move to America - I imagine, because he could no longer stand to have his love so tormented. If I only knew one thing - whether you would allow me to love you and win you and marry you after all - if I only knew that! I loved this story. It has a bittersweet ending, as did The Return of the Native. 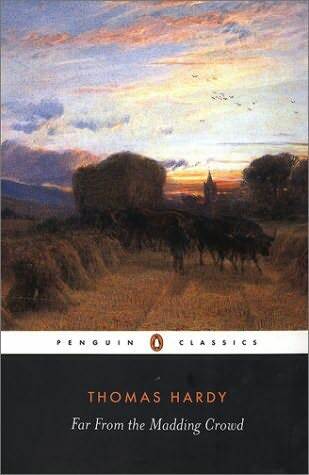 If I read another Thomas Hardy novel, what should I consider? Any suggestions? Have you read Tess of the D'Urbervilles? All the Hardy novels I've read are bittersweet. But they so beautifully written. No, I have not. I will add that to my list. Thanks! I really want to read Tess. Hi Ruth. I've been enjoying your posts so much lately! I haven't read this book, just watched the movie. And it seemed quite inevitable that Miss Bathsheba would end up with Mr. Oak (who, regrettably, looked a lot like a sheepdog in the movie, so much so that every time I saw him I thought "sheepdog"). I wonder if the book made Mr. Oak a little more compelling than the movie? Movies have a way of making goodness look quite bland . . .
From the movie, I remember he felt a little homely to me, but I could still see his good qualities. He's the adult in the story. In the book, he has a commanding presence that stands out, though to the side or in the background. He's the only one who has his feet firmly planted on the ground, while the rest of the town is out of their minds. He very kindly puts Bathsheba in her place a few times. Movies tend to paint pictures for us, and we may experience those images differently. But the book definitely does him justice, which is nice. I know, I know. Just not enough time in the day to read them all. It's so disheartening! I just ordered a Penguin Classic Hardbound copy of this book! Thanks for the recommendation. And then I'll have to watch the movie. I really liked the BBC version of this, but haven't seen the new movie or read the book yet. I'd like to, maybe in the fall when I'm in the mood for something melancholy. Well, I've not seen the BBC version. I'll have to check out my library for a copy. It was wonderful, Jillian. I'm so mad b/c it looks like the movie is not available to view online, at least right now. Neither Netflix or Amazon are showing it. I may have to just buy a copy. I listened to this as a teen, and reading this post just brought back some very pleasant memories :) I think maybe watching the film should be next! The 2015 film version is wonderful. And I think there is a BBC version, and another film edition, but I've not seen those. I love the book and the 2015 film version so much! This is one Thomas Hardy I have not read. I will now. You make it sound wonderful. He is a wonderful writer. I guess he really wanted to be a poet, but he ended up writing novels - and his poetry comes through in his stories. I had this given to me late last year for my birthday but Haven't read it yet so I skipped the spoilers! I really liked The Mayor of Casterbridge but didn't like Tess - too fatalistic for me. Loved Adam Bede. Thanks, Carol. I also heard something good about The Mayor, so I will add that (and Adam Bede) to my TBR list.